Have you ever heard of Opera Cremes? They are out of fashion now, according to Grandpa's vintage books, because they are tiny and have to be hand-dipped in chocolate. But they used to be popular among Victorian opera-goers, for precisely the same reason. Tiny candies are easier to sneak into long opera performances, and you can eat them surreptitiously. No large nut-cruching to distract the performers, no large mouth movements to give you away. Grandpa's books have a couple of recipes for opera cremes, one of which includes instructions for topping with a layer of melted chocolate and cutting into pieces larger than 1/4 inches. What's not to love? I have apparently become accustomed to learning the ins and outs of a new recipe online, with an absurd number of photographs, something notably absent from the books. When the book says, "beat candy until it just loses its gloss", I'm a bit vague on what that means. If it's just lost its gloss, are parts of it still glossy? What is the final texture I should be looking for? How much should I worry about the candy slapping around in the mixer bowl? Should I have avoided the mixer altogether? Is it even possible to mix or beat the candy thoroughly enough by hand, assuming I'm not a mid-1960s Midwest farm wife with upper-body strength augmented by regular wrangling of livestock or prize vegetables? These are not Opera Cremes. 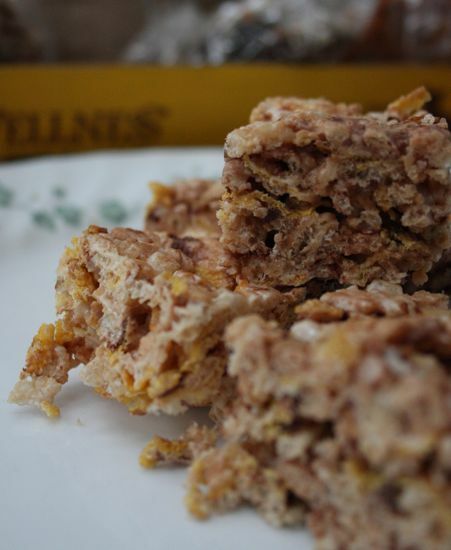 These are Opera Crumbles. My current theory is that I didn't recognize the moment of "just lost gloss" and overbeat the candy. At this stage, it doesn't even press together nicely. 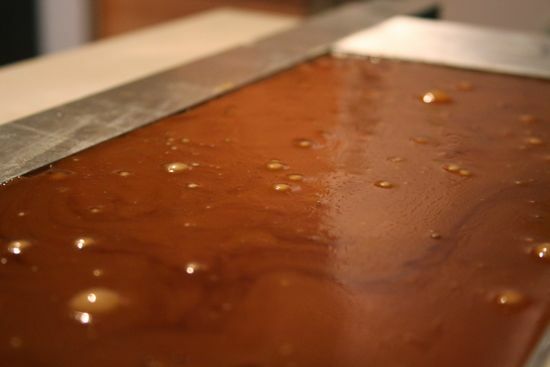 It tastes lovely (a butter-free caramel with diced pecans), but forget covering it in chocolate and cutting it into squares. It's a crumble through and through. 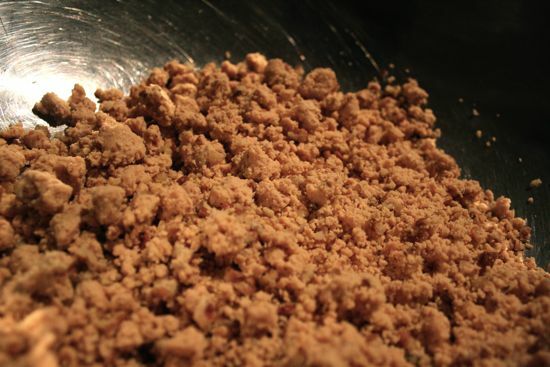 What does one do with over a pound of Opera Crumble? These are basically glorified Rice Crispie Treats (although I did look at the Porcupine Ball recipe from Celebrating Candy). 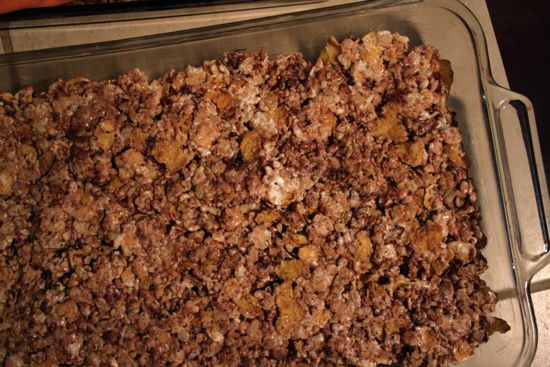 I used corn flakes, rice crispies, marshmallows, mini chocolate chips, plus my opera crumbles, making more or less a double batch of treats to use up all the crumble. These are a strange but tasty accidental creation. The candy bits give the treats a richness that I don't get when I make regular Rice Crispie Treats. And they've got enough oomph - probably thanks to the corn flakes - that a small piece is usually enough (unlike the regular kind, which is unsatisfying in any size smaller than "brick"). 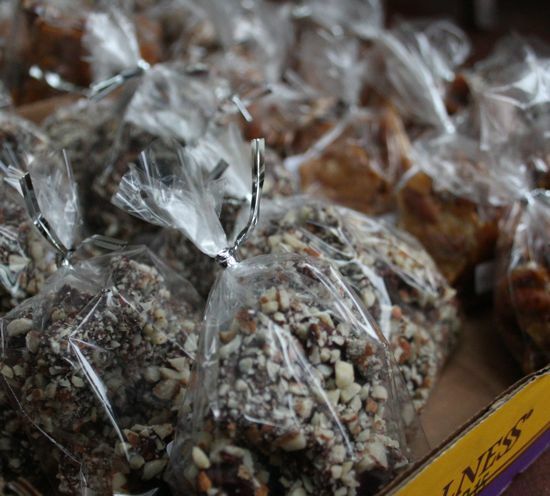 The downside, of course, is that to make Opera Crispies again, I'll have to overbeat a future batch of Opera Cremes. Or maybe I should look at it from the other angle: At least I know what to do when I attempt Opera Cremes again and need to make three batches before I get the beating thing figured out. Anyone want to come over for post-holiday treats? Oh, and Steph is doing a pre-sale "circus" this week for Cake's second pattern, Pavlova, a wrap top and skirt. 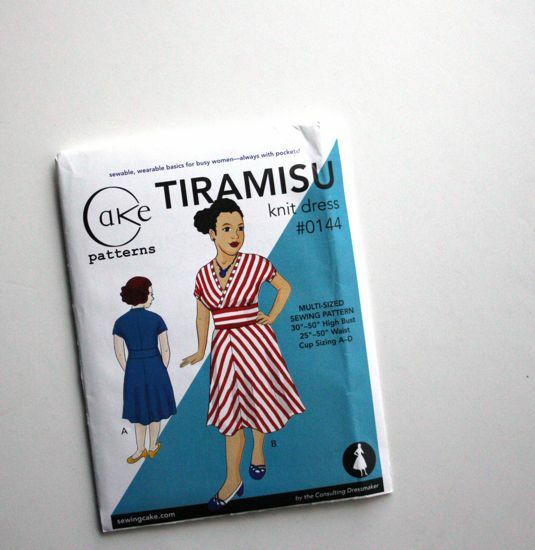 I bought my Tiramisu pattern during the last pre-sale (Steph uses the pre-sale to fund the printing run for the pattern) which basically worked out to a reasonably priced multi-sized pattern with free shipping. If you think you might want a Pavlova of your own, get it now! I'll probably kick myself later for sitting this one out - I've got to make some progress on the pile of projects before I add any more! Taking pictures of our cat is hard. Wasabi doesn't pose. He sleeps in dark corners. 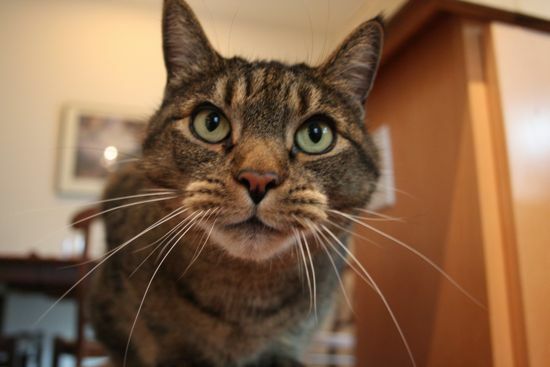 He's prone to rearing up on his hind legs and swiping at things out of place, including camera lenses. Every once in a while, though, he'll get curious about a camera. Actually, I think he's not so much curious about the camera as why this weird black thing is hovering in front of my face. Wasabi likes to visit people in the kitchen, since, obviously, we might be talked into feeding him. Also, he's realized that the catnip lives in the spice cupboard. Any time I open that cupboard, it could be for him, right? 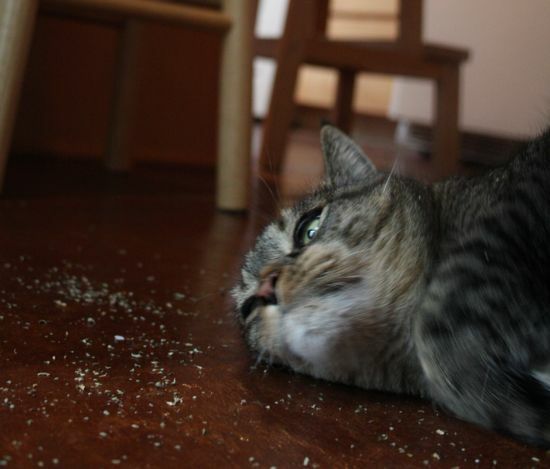 I wish I had a picture of him trying to put his whole head in the catnip jar. It's a small jar. Wasabi has a big head. Hilarity ensues. This will just have to do for now. I'll be in the kitchen for most of the month. The first batch has been beta tested and deemed a success. I'm still not sure what the final collections will include beyond the essential caramels and English toffee. I've got all of Grandpa's candy books, which mostly means that nothing is impossible. Which leaves me with improbable amounts of sugar. Hooray!